What I'm Reading: The Goldfinch by Donna Tartt | Oh Sarah O ! I did it! I finally finished the A Beautiful Mess May book club selection, The Goldfinch by Donna Tartt (all 755 pages of it). Let me tell you, I thought I would never get it finished! It's not that I didn't enjoy the book. I felt that the book dragged on in a few sections (namely when the main character goes off to live with his father in Las Vegas, Nevada- that section could have been reduced by a few hundred pages), but overall I felt this was a good read. 1. Probably the most obvious question that we must discuss first is what is the goldfinch? What does the painting represent in Theo's life (or in general)? I think the goldfinch is the catalyst which seems to steer Theo's path in life and hold it all together. Initially, Theo is drawn to visit the painting with his mother because it holds special meaning to Her. But it's the painting that leads him to meet Welty (and consequently Hobie and Pippa) and it also leads to his re-acquaintance with Boris in adulthood. At the end of the book, Theo talks about how the goldfinch painting is able to touch it's admirers in a way that's unique to each individual admirer and how it is able to exist unchanging as if it's untouched by time and therefore more real that human reality. I think that because the painting meant so much to his mother and Welty that he kind of clings to it to preserve some memory and connection to his mother (especially) and to Welty. 2. What do you think of the Barbour family? They take Theo in after his mother's death, but do you get the feeling that they resent this effort, or not? What do you think of their reaction to Theo later in life? I thought that overall the Barbour family (particularly Mr. and Mrs. Barbour and Andy) meant well and probably initially likened taking in Theo as another charity project, but they probably hadn't planned or intended for Theo to stay with them permanently. However, I think that the younger Barbours like Platt, Kitsey and Toby may have resented Theo because they may have felt that Theo received special/preferential treatment from the Barbour parents and took the parents attention away from the other kids. As someone who has lost a parent, I think that the Barbour's were probably genuinely pleased to be reacquainted with Theo following the deaths of Andy and Mr. Barbour to try to preserve some of the memories from the past when both Mr. Barbour and Andy were around. 3. What do you think of the way fellow peers and adults treat Theo after his mother's death? Were you surprised by some of their reactions? Have you ever experienced anything similar (from either side)? I remember a young man losing his home (by a house fire) when I was in middle school, and I remember having no idea what to say to him to communicate that I cared, but I couldn't really do anything for him. It's a tough feeling, so I could understand some of the students simply choosing to avoid Theo. Since Theo's mother died during a major news-worthy event, I think it's natural for other people to either be super curious and want to ask tons of questions about what happened or shy away and wait for the person experiencing loss to make the first move. 4. What about the role of chaos in this book. Do you think the world is chaotic and full of experiences that we cannot have control over (like the explosion that killed Theo's mother)? Do the characters in the book feel this way? How does it shape the choices of their lives? After the explosion Theo keeps trying to blame himself for his mother's death by thinking that if he hadn't gotten in trouble at school that day that his mother would still be alive-which points to the idea that perhaps initially Theo felt that could have had some control over his destiny. But it's pointed out at the end of the book that Theo feels like life is already predetermined and that you have little control over your destiny, whereas Boris thrives on the idea that the world is chaotic and that good choices don't necessarily result in a good outcome and you just take it in stride. I think it's Theo's belief that life is already pre-determined and out of our control that leads Theo to continually make self destructive choices like take drugs and make poor investments. But, I tend to subscribe more to Boris's view that the world is chaotic and full of experiences that we cannot control, which I think enables Boris to be able to perceive others in a more realistic way (i.e. Theo's father) and have a clearer head to problem-solve and come up with solutions to get himself and Theo out of their jams ( i.e. how Boris was able to retrieve the painting for Theo). 5. I don't usually ask this, as I often think it's assumed, but did you like the book? Did you stay up all night reading it, or did you find it a chore? One of my favorite things about this book club experience is seeing how others react to a book, often in different ways than me. As I said at the top of this post, overall I found this book an enjoyable read- it's got art, drama, action, a bit of mystery, but I felt that parts of this book dragged out a little longer than they needed to and THIS BOOK IS REALLY LONG. Don't get me wrong, I've read books with many more pages than The Goldfinch, but I often don't complete those books in a months time either. I like to read pages slowly to take it all in. I found that I didn't really like many of the characters in this book. I wanted to like Theo as he is the main character and initially felt I could empathize with him because we've both lost a parent, but I couldn't relate to his teenage and adult drug binges and other self-destructive behaviors or his approach to life and by the end of the book I didn't really like his character at all. I also found it hard to relate to Boris and while I do relate to his approach to life, I couldn't really relate to his lifestyle. I found most of the Barbour family to be a bit pretentious and found my favorite characters to be Hobie, Welty, Pippa, Andy and Mrs. Barbour. How was Theo able to survive the explosion when so many other's around him perished? Is this an example of the chaos theory? How did Boris end up retrieving the painting in Amsterdam? Did Theo actually get away with murder!? So is Theo's engagement to Kitsey officially off? When Theo finds out that he doesn't actually have The Goldfinch painting anymore couldn't he have just told Lucius Reeve and put an end to the blackmail? Did Lucius drop his blackmail threats at the end of the book? A reader on the A Beautiful Mess comments section also pointed out the parallels between The Goldfinch and Harry Potter; not just simply that Boris refers to Theo as Potter or that Theo becomes an orphan, but they thought Welty and Hobie had kind of a Dumbledore/ Hagrid type of relationship. I just wanted to say that I totally pictured the Hobie character as a more modern day Hagrid in my mind- I even gave him Hagrid's voice. Did anyone else picture him like that? Read any good books lately? Are you participating in the A Beautiful Mess book club? 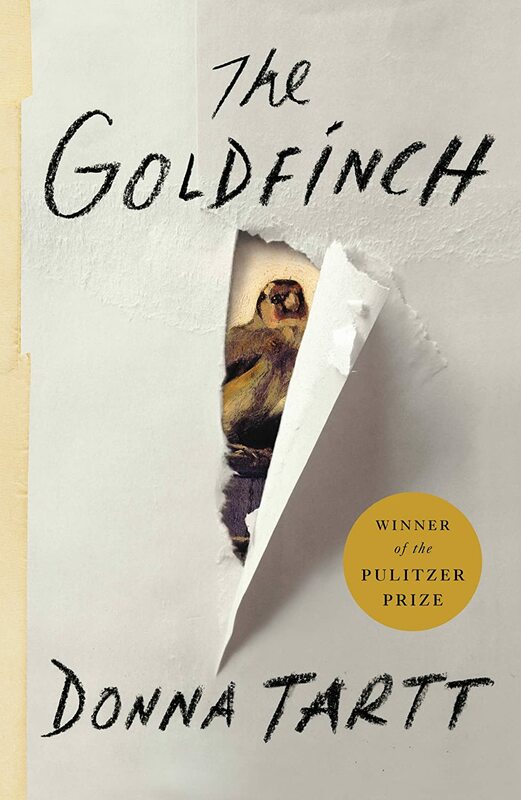 Have you read The Goldfinch by Donna Tartt? If so, what did you think of the book? I've got a bit of catching up to do for the book club. Next up for me is June's book club selection, The Good Luck of Right Now by Matthew Quick (author of Silver Linings Playbook), followed by July's selection, #Girlboss by Sophia Amoruso (founder of Nasty Gal), and then August's selection, Flight Behavioir by Barbara Kingsolver.